A devastating brain injury slowed down photographer and runner Brian Nice, but he stayed in life’s race with support from his RIT teammates from 30 years ago. 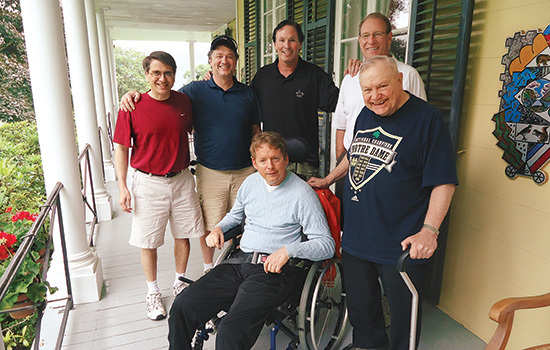 From left to right, teammates Jim “Squirrel” Pasquali, John “B.J.” Brennan, Tim “Tank” O’Grady, Chris “Crisco” Roe and Coach Peter “The General” Todd visited Nice at his home in Garrison, N.Y., in June 2012. Brian Nice was at the height of his career. For 25 years, the 1984 photography graduate had been shooting fashion for magazines such as Elle, Madame Figaro and Cosmopolitan and ad campaigns for L’Oreal, Oil of Olay and Givenchy. His book of portraits depicting celebrities with their dogs was set to come out in a few months. He was living in a dream home he helped build that was steps from the ocean on the south shore of Long Island, and in his free time he was an avid surfer, wind surfer and runner. But his fast-paced world ground to a halt on Aug. 18, 2009. Nice was working in Manhattan on a photo shoot when he suddenly became violently ill. He was rushed to the hospital, where doctors discovered that a birth defect, a malformation on his brain stem, was causing devastating internal bleeding that quickly robbed him of many of his basic motor skills. Over the last four years, he’s had to relearn the simplest things—how to breathe, how to swallow, how to talk. What has helped Nice through his struggle, he says, are the friends he made—and the lessons he learned—while an RIT undergraduate. Topping that list of friends are his cross country and track teammates, some of whom he ran with in the historic 1979 coast-to-coast relay, and their coach, Peter Todd. The teammates say Nice—just like in college—is the giver in the relationship, the same fun-loving guy who comes up with unexpected ways to express his creativity. One of those ways involved a trip this fall inspired by RIT’s 1979 relay to show that people with traumatic brain injuries can still do what they love. When a new runner joined Coach Todd’s cross country team, he was given a nickname, usually by an upperclassman. Campbell was called “D. Campbell” when teammates discovered that label on his running clothes. He had transferred to RIT from Alfred State College in 1978. Even though Campbell was a few years older, the future engineer and the photographer with somewhat opposite personalities became fast friends. Perkins, known as “Perk” to his teammates, says it helped that they were both handsome and attracted the attention of pretty girls on campus. Their bond grew stronger that November when Campbell and Nice were part of a 12-man team tapped by Coach Todd to run across the country. Perkins also participated in the run, which was organized to celebrate RIT’s 150th anniversary. Only seven student cross country runners were invited to be part of the group, and Nice was the only freshman. Coach Todd, called “The General” by his runners, and four alumni made up the rest. The men took turns running two-mile legs, one at a time, 24 hours a day, seven days a week. When they weren’t running, they slept or drove Todd’s Chrysler New Yorker and the Winnebago that followed along. Campbell says the run was challenging and the jokester Nice did his best to keep the group laughing. He remembers at one point in Kansas, Nice went into a ditch and threw tumbleweeds at the runner passing by in an attempt to make the barren farmland more visual for a photographer documenting the run that day. “It was little things like that in our aches and pains and sleep deprivation that gave us levity and kept us going,” Campbell says. The coast-to-coast runners finished in 14 days, 4 hours and 8 minutes, fast enough to be listed in the Guinness Book of World Records. 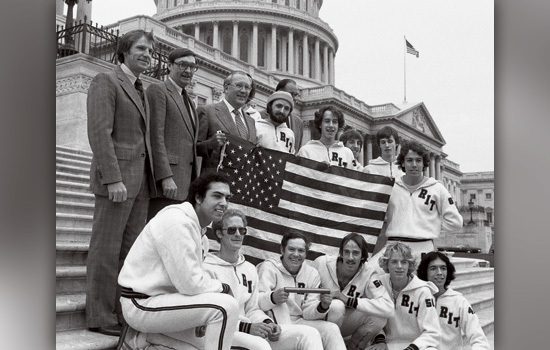 Even without the coast-to-coast run, RIT’s cross country team was a close group, a fraternity of sorts. During the season, they would run as much as 140 miles a week together, says Perkins, who has worked in the footwear business for 30 years and lives in New Jersey. If they attended all of the weekly practices, Coach Todd would buy them breakfast on Sundays. Running for most of them was a nine-month sport—after cross country they moved to indoor track and then outdoor track. They would travel to Florida during spring break to train. Jim “Squirrel” Pasquali ’86 (computational mathematics), who joined the cross country team as a freshman when Nice was a junior, said that bond was strengthened because of their coach. During pre-season, the runners sometimes lived in Todd’s house so they could focus on their training, sleeping on mattresses on the floor. “We would run, eat, run, eat and sleep,” says Pasquali, a software engineer for Xerox Litigation Services in Albany. Nice was the spirit of the team, emotionally and in the record books. Nice is part of the group that holds the indoor sprint medley record from 1983. His time of 3:51 in the outdoor 1,500 meters was a school record for 25 years until it was broken in 2008. After graduation, the teammates went their separate ways. Nice moved to New York City, where he was told that if he wanted to be more sophisticated as a photographer, he would have to experience the world. So he headed to Australia as a freelance photographer. There he got his first break shooting for Cosmopolitan Australia, which led to jobs for international editions of Elle. After Australia, he moved to Paris, where he made photos for Madame Figaro each week and continued shooting for Elle. After he returned to New York in 1998, his portfolio included work for J. Jill, Pendleton Woolen Mills and Norm Thompson catalogues. He also made time for his own side projects. In 2008, he worked on a landscape photography project with his father, Don, who is an accomplished painter. They traveled to Greenland where they documented icebergs—Nice in photos and the senior Nice in paintings. A year later, Nice made a book of portraits of 150 celebrities with their dogs called Rescue Tails. His own dog, a pug named Buster who was saved from blindness by a doctor recommended by the Humane Society of New York, inspired him. Proceeds from the book benefit the Humane Society. Throughout it all, Nice and Campbell kept in touch. Nice visited Campbell when he lived in Boston and New Jersey and later made a point to fly through San Francisco, where Campbell had moved, on return trips from Australia. Campbell, a self-employed engineering consultant who has worked primarily in the U.S. nuclear industry since graduation, visited Nice in New York. One of those visits was about 15 years ago. Campbell remembers walking up Broadway when Nice told him about the deformity in his brain stem. Nice hadn’t been back in Rochester since he graduated when he attended a cross country alumni dinner in 2008. Once a year, Coach Todd organizes a get-together around Thanksgiving. He sends notes with pre-addressed stamped envelopes to the runners he coached between 1965 and 1996. Todd says usually about 30 attend. John “B.J.” Brennan ’85 (computer science) says Nice was one of the few at the dinner who still looked like he did in college. Nice made sure to take it all in, running eight miles around the campus before driving home the next day. 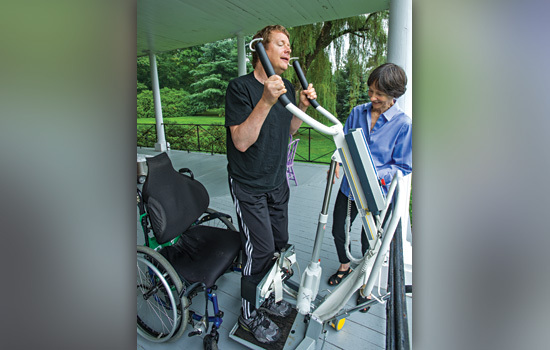 He did his best to continue his active lifestyle despite the malformation on his brain stem. Nice was born with his condition, which is called a cavernous malformation in the pons area, but he didn’t know anything about it until the late 1990s. But he attributed that to too much partying in college and too much work or surfing after college. When he got an MRI and learned the cause—the malformation was on the brain stem, which controls basic human functions like breathing—he didn’t change his lifestyle. Then that August day in 2009, he was shooting the spring line for J. Jill’s fashion magazine. His vision became blurry and he began vomiting. He finished the job and was rushed to New York Presbyterian Hospital’s intensive care unit. Doctors told him if he hadn’t been so close to a hospital, he would have died. It took three weeks to stabilize him before he had the operation to stop the brain stem from bleeding. Unlike an aneurysm, which bursts, his bleed slowly oozed. The brain surgery was successful, but smaller surgeries and a long rehabilitation followed. Nice had to relearn everything. He communicated with his left index finger, the only part of his body he could move. His father would recite the alphabet and Nice would move his finger when he got to the letter in the word he was spelling. Pasquali and the other teammates visited as often as they could. Both Campbell and Perkins saw him in the hospital before the operation. After the visits, they sent email updates to as many as 60 runners. Coach Todd started sending a card a week. At the alumni dinner that November, the group made a video for Nice, with each person expressing his encouragement and sharing memories of their RIT days. Nice exceeded all expectations during rehabilitation and progressed to the point where he could walk on his own with a walker. “He put in the same effort he used to put into his career and running and it showed,” says Kulzer, who lives in Troy, N.Y., and works as an engineer for the New York State Department of Transportation. But a year later, doctors discovered another malformation two times as big and in a more complicated spot on his brain stem. 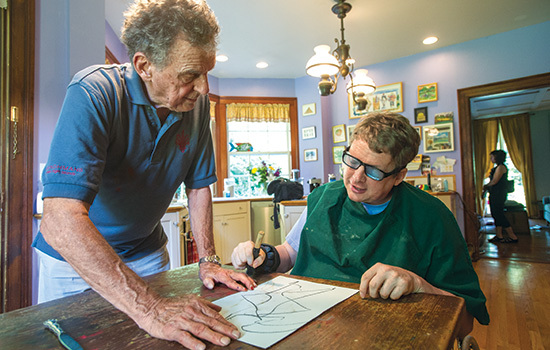 His rehabilitation after the second surgery was slower, and progress was delayed because of a series of seizures in April 2012. Nice’s mother, Sandra, grabs her son’s prism glasses and slides them into place on his face. “I look like a trendy French architect,” he says, working hard to enunciate so he can be understood. Nice’s vision hasn’t been the same since the first operation. When he shuts his left eye, his vision goes up and down, and when he shuts his right eye, he sees side to side. “If I open both eyes, it’s a party,” he says with a little chuckle. The glasses help subside the dizziness. One of his first concerns after the surgeries was whether he would be able to shoot photos again with his double vision and shaky hands. Cognitively, Nice is the same guy he has always been and he likes to be working on a project. A friend gave him a point-and-shoot camera called a Holga. He attached it to a small tripod so he could hold it while someone else pushes the shutter release. The photos, taken from the front porch of his childhood home or during his trips to the nearby Helen Hayes Hospital Rehabilitation Center, represent how he sees the world. How does he make them blurry? Last fall, 60 of his photos were in a show called “A Point of View” at the Garrison Art Center. This fall, Nice recreated the 1979 coast-to-coast run in reverse, traveling 7,000 miles round trip from his home in Garrison, N.Y., to Santa Monica, Calif. Instead of running, Nice photographed the American landscape to show that people with traumatic brain injuries can still do what they love. He hopes to create a coffee table book, a gallery exhibition of his landscape photos and a documentary about the trip. 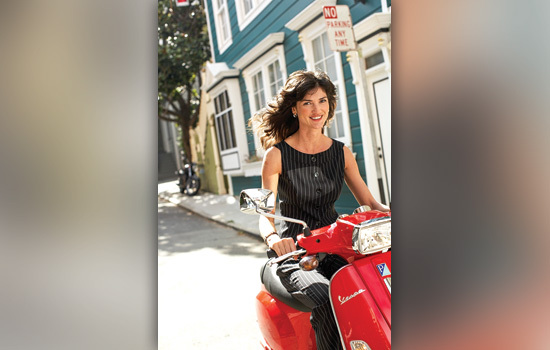 Jeanne Arnold ’83 (communication arts), a freelance art director who Nice first met in college and then later worked with on catalogue shoots, was in charge of the fundraising. They raised almost $50,000 through an online fundraising site. His mother was his primary caretaker and personal assistant on the trip, just like she is at home. Five friends also went along to film it, blog and drive. Campbell met Nice in Hermosa Beach, Calif., and again in Palm Springs. He says the trip brought back good memories of their first cross-country venture and he was happy he could support his friend. Campbell even dressed in some old track clothing and ran across the dessert while Nice photographed him—just like in 1979. For Nice, the trip was just as challenging as the first one. Although this time, the challenge was sitting for long periods in the van, which he nicknamed The Beast, and maintaining his energy levels. But it also reminded him of one of the happiest times in his life. Nice has a lot of time to think about his past, about the friends who have stood by him, about living with his supportive parents at the age of 52 in his childhood home, using a wheelchair for mobility for now. He longs to do something simple, like jump in the car and go get coffee on his own—the little things people take for granted. But he isn’t bitter or sad. He has met other traumatic brain injury patients who don’t have a support system. He has five photo albums full of letters and cards from the past four years from his friends. Coach Todd continues to send a card a week. The teammates visit at least once a year, usually in groups and sometimes before catching a men’s hockey game at nearby West Point. They even drove their former coach five hours to see him. Just like when they were in college, the runners are family, always pushing each other to be better. Getting better, Nice says, is his next challenge. Click here to see a photo gallery of Brian Nice.